We want to tell you what is a single inhaler model. Moreover, the age range of this inhaler now is extended! And this is great news for children-asthmatics and their parents! Symbicort includes two components: therapeutic (anti-inflammatory) – budesonide, and bronchodilator – formoterol. 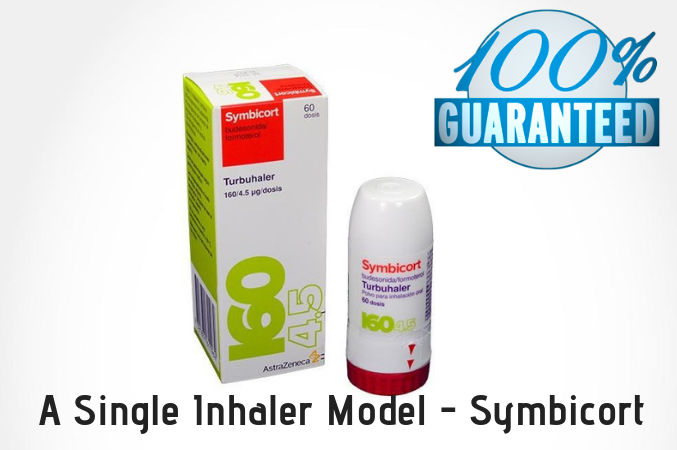 The combination of their properties determines the choice of Symbicort as a single inhaler model. Single inhaler mode (SMART-therapy) lies in when the patient receives a fixed dose of the inhaler + takes the same drug as needed, to stop the asthma attack. Budesonide, which has the highest safety among inhaled hormones, is approved for use in children aged 6 months, as well as during pregnancy. In this SMART therapy, Budesonide has a rapid onset of action, and increasing its dose at the onset of asthma exacerbation enhances the therapeutic effect by avoiding the administration of systemic (in injections or tablets) hormones. In addition, budesonide (in standard doses) can be used once a day. Formoterol is today, perhaps, the most universal bronchodilator drug, providing a quick and long-lasting (12 hours) action. The rapid onset of the effect allows the administration of formoterol for the relief of asthma symptoms. The essence of the SMART therapy is that the patient uses Symbi-cortex (at an adult dose of 160/4.5 μg) for a constant basic therapy (for example, 1 inhalation in the morning and in the evening), and also uses Symbicort on demand in place of additional inhalations of short-acting bronchodilators (salbutamol, fenoterol, berodual). When the condition worsens, the need for bronchodilators increases. Applying Symbicort for the relief of symptoms, the patient not only quickly relieves breathing but also in time, in response to the earliest manifestations of the onset of exacerbation, increases the volume of anti-inflammatory therapy. After stabilizing the condition, the need for additional Symbicort inhalations quickly disappears, and daily doses of the inhaled hormone decrease. The effectiveness and safety of the SMART therapy were confirmed during major international clinical trials, in which more than 14,000 patients participated. These studies have shown that the use of SMART therapy more effectively prevents asthma exacerbation than the use of even higher doses of inhaled hormones or combination drugs. SMART asthma therapy is convenient and understandable to patients. It does not require training on how to change the dose of drugs: a person simply uses Symbicort at a certain maintenance dose in the morning and evening, as well as when symptoms appear. To change the dose, there is no need for a special assessment of the symptoms: the correction occurs as if “automatically” when the condition worsens or improves, which more effectively prevents exacerbations. It is also important that a person quickly senses the effect of treatment with Symbicort – from the first hours and even minutes after the beginning of the reception. The dose of Symbicort should not exceed 12 puffs per day. However, high doses of Symbicort in this regimen are used extremely rarely: as clinical studies have shown, usually no more than 2-3 additional puffs of Symbicort per day are required, and most patients do not exceed 3-4 per week. To Whom can a Symbicort as a Single Inhaler be Prescribed? These are children and adults (12 years and older) who have been diagnosed with bronchial asthma and who need basic therapy with a combined drug. Studies have shown that this mode of dosing has a positive effect on disease’s control, reducing the risk of exacerbations, as well as the total amount of drug therapy (including systemic hormones). The drug is clinically safe for children from the age of 12 in the mode of smart therapy (previously it was from 18). The drug is NOT in smart mode, it is allowed for children from 6 years at a dosage of 80 / 4.5 mg.